When the New Braunfels Chamber of Commerce published a new brochure in the 1960s, they (rightfully) had a lot to boast about. New Braunfels was just beginning its change from a small town to a large town. Today, our community is changing from a large town to a city. Growth always produces changes – good and not so good – but many things remain the same. People still want the best for their families. They want good schools and good churches. They want activities and entertainment. They want to feel safe. And, they want to feel like they are a part of something – they want to belong. The “Beauty Spot of Texas” does not adequately describe the lure of the captivating attractions offered vacationists, sportsmen, tourists, and the opportunities for business men and those seeking a year ‘round home here in New Braunfels. Only by coming to this peaceful community, nestled at the foothills of the far famed Texas hill country, can one really appreciate the charm this area affords. Landa Park, where the taut nerves relax, and the great outdoors beckon, has for years been a Mecca for visitors. One of the Southwest’s largest outdoor swimming pools, filled with the crystal clear waters from the famous Comal Springs, constantly changing, assures the finest bathing facilities. Scenic drives, both in the City and the Texas hill country, along roads lined with wild flowers, and ranges abounding with wild deer and other game, are plentiful. Hunting and fishing are excellent. Golfing on one of the sportiest nine-hole courses in the country with well-trimmed fairways, grass greens, and six water hazards make this course most unusual and inviting. The Comal Springs, said to be Texas’ largest with a daily flow of two hundred ten million gallons of sparkling water, bubble up from subterranean rivers to form the enchanting Comal, the largest, shortest river in the world. The beautiful Guadalupe flows through the City on its way to the Coast. Altitude 644 feet at the Plaza; 1700 feet in the nearby hills. Population: New Braunfels 8,000; Comal County 12,500. Average temperature: summer 78.4°; winter 58.4°. Ranches: 375 in Comal County; 800 acres average. Farms: 750 in Comal County; 72 acres average. Churches: 13. All housed in fine buildings. Schools: 6 public and 2 parochial in the City. Manufactured products: flour and feed, cotton textiles, silk hosiery, gauze, children’s garments, mattresses, cedar oil, dairy products, wool tops, monuments, lime, road building materials, rock, wool, leather goods, potato chips, cold drinks, roasted coffee, and ice. Comal County is one of the best 65 counties in Texas for future development of business. What differences from today’s city do you find? The temperature definitely is warmer. And what happened to all those ranches and farms? There are many more schools and churches. New Braunfels produced potato chips? Our very location guarantees that New Braunfels and Comal County will continue to grow and change. No longer rural, but urban in nature, we still have a lovely quality of life. “Just a Grand Place to make a Living and a Grand Place to Live”. 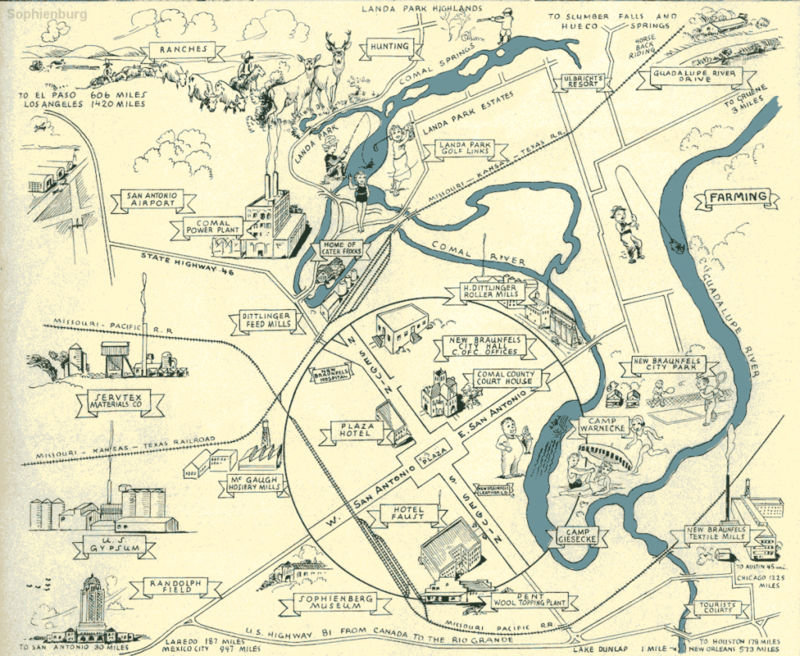 Map from the 1960-era New Braunfels Chamber of Commerce brochure.